Yesterday I was working on my laptop. Suddenly I noticed that the indicator light of the webcam was on, despite the fact that I wasn't making a video call or using the webcam in any other way at the moment. It freaked me out that some unknown application on my computer was using my webcam without my permission, and possibly sending that video stream to god knows where on the Internet. In the end, it turned out to be Skype which was in the process of crashing. (Despite me making no calls at the time.) So that story ended well. But next time I see the webcam indicator light, I want to be ready. I want to be able to know exactly which app is using the webcam so I could destroy it. Does anyone know how I can find out which app is using the webcam? As already suggested by harrymc, you can use Process Explorer to easily find out which programs currently use your Webcam. 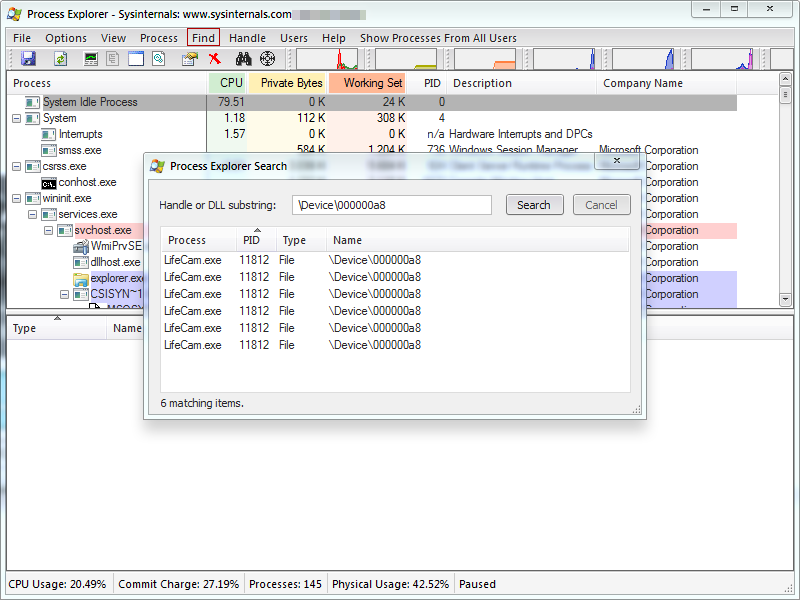 All you need to do is to find your Webcams Device Handle and search for it in Process Explorer. 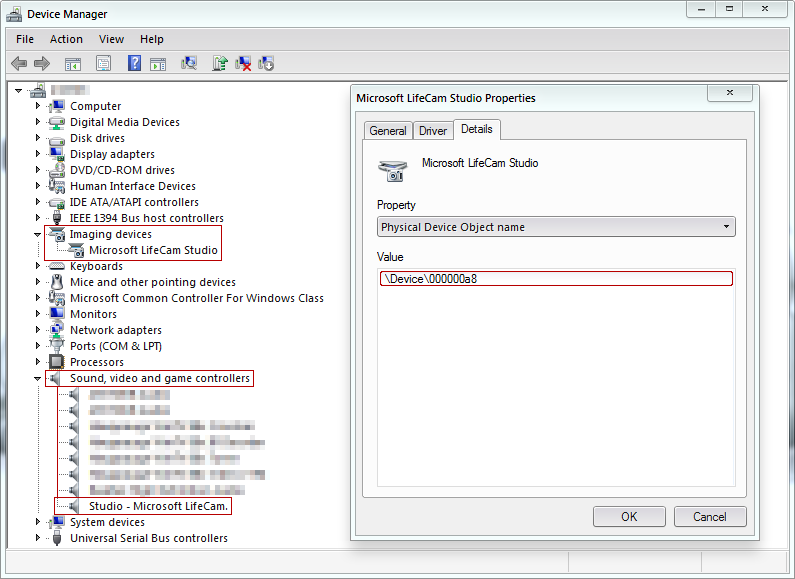 First, search for your Webcam in the Device Manager, it should be under "Imaging devices" but can also be under "Sound, video and game controllers" if it has a built-in Microphone (like in my case). Beware that it has two Device Handles in that case. Right-click and select Properties (or Double-click), go to the Details Tab and search for "Physical Device Object name" in the Properties dropdown list and copy the value. Now go to Process Explorer and click on "Find", then "Find Handle or DLL..." (or press CTRL+F) and enter your previously copied Device Handle. Click search and after a bit of wait you will get a list with Processes using your Webcam. Again: Beware that your Webcam's light might also be on because a built-in Microphone is in use, in which case you will also have to search for the Microphones Device Handle as well! My idea is that maybe you could use Process Explorer to search out which program has opened the device. Try it first when it is open by Skype or some other known program. 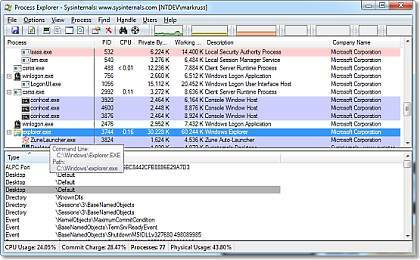 Process Explorer can show you which files and devices are opened by this program, to find out what is the name of the device. You could then use the Search function with the device name to see if it does find this program. If this works, then in the future Process Explorer can find for you which program is using the webcam. Applications using "handles" to access various interfaces provided by OS. Device handles is actually "file handles". Process Hacker ( http://processhacker.sf.net/ ) can search handles in all processes (Ctrl+F to open "Find handles and DLL's"). I found that after comparing all \Device* handles opened by skype.exe while my webcam is on and off. Find out the model of the webcam and if there's additional software that be installed to support it, I know some Logitech webcams have a 'webcam management application' that let you control the webcam features and sometimes report when it's in use and by which application. As far I could see there's no really well known and trusted software to help with managing any webcams by reporting what's using it, and is looking like it requires the use of the software that the webcam manufacturer ships, or the tools provided by the laptop manufacturer like Dell. So then you just have to hope that your webcam manufacturer has that "in use" reporting feature. If not - make that a requirement for a future upgrade replacement webcam. Not the answer you're looking for? Browse other questions tagged windows windows-xp security webcam or ask your own question. How to detect the application/process that's using the camera? how to find out which software is using my webcam? how to close applications using webcam dell integrated webcam? Webcam turned on itself. Why? How to know your built-in webcam specification and functionalities (security related)? How can I make a shortcut to the webcam?